Fire management personnel face multiple decision points on every shift of every assignment. From deciding the best route to approach a fire to deciding if command of the fire should be transferred to a higher level of management organization, there are a myriad of decisions to be made. Making decisions is a critical portion of our jobs and Tactical Decision Games (TDGS) are a great way to practice making decisions and communicating those decisions to others. "How We Decide" article - A paper by Major John F. Schmitt comparing Analytical and Intuitive decision making. Review the STEX/TDGS workbook for information on designing TDGS. Print the TDGS Format to guide you through the development process. Develop your scenario as a Microsoft Word document following the TDGS format. If possible develop your map in electronic format along with your TDGS. If you are submitting a topo map, clearly specify on the map the sections used for your TDGS. Your scenario will be evaluated and if accepted it may be edited. It will then be posted to the TDGS Library at the next update. Players should establish command and control with all resources on-scene. This can be used as a drill to discuss Standard Firefighting Orders #8 and #9 and Watch Out Situations #5 and #6. Players should verbally communicate their decisions to the appropriate individuals. Players will determine how to establish a communication link. This can be used as a drill to discuss Standard Firefighting Order #7 (“C” in LCES) and Watch Out Situation #7, as well as the IRPG reference “LCES Checklist.” Players should verbally communicate their decisions to the appropriate individuals. Players should decide if the current escape routes are adequate for the expected fire behavior. This can be used as a drill to discuss Standard Firefighting Order #4 (“E” in LCES) and Watch Out Situations #3 and #17, as well as the IRPG reference “LCES Checklist.” Players should verbally communicate their decisions to the appropriate individuals. Players should establish command and communicate their intent to all resources. This can be used as a drill to discuss Standard Firefighting Order #8 and the IRPG reference “Communication Responsibilities.” Players should verbally communicate their decisions to the appropriate individuals. Players should determine requirements for posting lookouts. This can be used as a drill to discuss Standard Firefighting Order #5 (“L” in LCES) and Watch Out Situation #12, as well as the IRPG reference “LCES Checklist.” Players should verbally communicate their decisions to the appropriate individuals. Players will decide how establish effective safety zones. This can be used as a drill to discuss Standard Firefighting Order #4 (“S” in LCES) and Watch Out Situations #3 and #17, as well as the IRPG reference “Safety Zone Guidelines.” Players should verbally communicate their decisions to the appropriate individuals. Players will decide if the situation falls within their span of control at the Incident Commander Type 4 level. This can be used as a drill to discuss Standard Firefighting Orders #8 and #9 and Watch Out Situations #5 and #6. Players should verbally communicate their decisions to the appropriate individuals. Players will determine how to mitigate the risk of not having an immediate anchor point. Players should verbally communicate their decisions to the appropriate individuals. This can be used as a drill to discuss Standard Firefighting Order #3 and Watch Out Situation #8. Basic – Players will describe the risks. Intermediate – The players will describe appropriate mitigations that must be in place before approaching or attacking this fire. Complex – All the above, plus communicate their plan of action to subordinates. This can be used as a drill to discuss Watchout Situation #10. Players should verbally communicate their decisions to the appropriate individuals. Basic – Players will describe the associated risks with engaging the spot fire. Intermediate – The players will describe the risks and the appropriate mitigations that must be in place before engaging the spot fire. Complex – The players will describe the risks, describe their mitigations and communicate a plan of action to engage the spot fire. This can be used as a drill to discuss Watchout Situation #17. Players should verbally communicate their decisions to the appropriate individuals. Players should decide on direct or indirect attack strategy. This can be used as a drill to discuss Watch Out Situations #9, #10, and #11. Players should verbally communicate their decisions to the appropriate individual. Players should decide if their crew can engage in a downhill line construction assignment. This can be used as a drill to discuss Watch Out Situation #9 and the Downhill Line Construction Checklist. Players should verbally communicate their decisions to appropriate individuals. 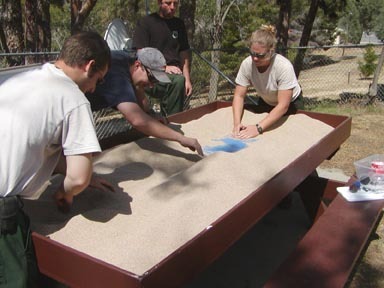 Players will determine how to handle an assignment involving a mid-slope fire edge. This can be used as a drill to discuss Watch Out Situation #13. Players should verbally communicate their decisions to the appropriate individuals. Players should determine how to mitigate risks associated with night operations and working in unfamiliar environments. This can be used as a drill to discuss Watch Out Situations #2 and #4. Players should verbally communicate their decisions to the appropriate individuals. Players will gather necessary information to practice the decision making process by controlling a non-fire incident. The role player will utilize local medical SOPs and implement a plan to deal with the medical/hazmat incident. The priority should be dealing with the non-fire situation. Logistics, Non-Fire – Hurricane in Hometown, U.S.
Players will recognize the need to prioritize the order of operations to provide for life/safety and recovery. The students must formulate a plan to solve the unique logistical issues in providing aid to the local town in a hurricane disaster recovery effort involving multiple agencies and jurisdictions. Establish a plan, order appropriately, and coordinate the operation with the local contacts. Players should decide on prioritizing an incident with limited information. When on scene, utilize resources in a safe and effective manner. Players should verbally communicate their decisions to the appropriate individuals. Players will recognize the need for and implement a Unified Command structure between USFS, County, local sheriffs and Department of Water and Power districts. The IC will assess the situation and decide a time frame and implement the evacuation plan. The IC will also pick a proper place for the ICP and staging area for incoming resources. Players will decide how to assign resources and communicate their decisions to appropriate individuals. Players will evaluate a prescribed burn planned in an intermix area and prepare a briefing to all personnel assigned. Players should verbally communicate their decisions to the appropriate individuals. The Burn Boss will be confronted with an outside resource going around the chain of command and will need to deal with the situation. The player should verbally communicate their responses to the appropriate individuals. Players will make decisions regarding what to report, who they will communicate with and what the priority communications are. Players will make decisions regarding public safety and prescription parameters during active ignition of a prescribed fire. Players should verbally communicate their decisions to the appropriate individuals. Players will develop a plan of action to transition from a prescribed fire to a wildfire, develop objectives and take action. Players should verbally communicate their decisions to the appropriate individuals. The Fire Effects Monitor will need to recognize hazards and set trigger points to safely mitigate the situation. The player should verbally communicate their responses to the appropriate individuals. Player will demonstrate the ability to determine appropriate firing patterns under varying conditions. Players should verbally communicate their decisions to the appropriate individuals. Various Supervisors will be confronted with a situation where they lose control of their resources. Players should verbally communicate their responses to theappropriate individuals. The Fire Effects Monitor (FEMO) will need to assess the protection of a backcountry cabin and order the necessary equipment to implement their plan. The player should verbally communicate their responses to the appropriate individuals. Players will determine how to mitigate the risk of an assignment that is dependent on aircraft support. Players should verbally communicate their decisions to the appropriate individuals. Players (IC & OPS) will: Interact with the ATGS providing incident objectives and priorities, fire landmarks (origin, flanks, etc. ); request a plan of attack from the ATGS; advise ATGS of changing priorities. A Report on Conditions may be requested by ECC or Division Chief. Players (ATGS) will: provide or help provide a plan of attack, clear ground troops from drop paths, order additional aerial resource request through proper channels (AOBD or dispatch), advise AOBD or dispatch of aerial resource changes. Players will determine how to mitigate the risks of working an isolated section of fireline with active fire behavior. Players should verbally communicate their decisions to the appropriate individuals. Players will recognize the need for and implement a unified command structure between the three responding agencies, LA CO, Pasadena City, and USFS. One agency will be identified as being the ordering point. Initial attack incoming resources will be assigned. The ICs should recognize the need for and establish the Operations Section Chief position at a minimum along with strategies for each jurisdiction and agency. Players should decide on an offensive or defensive strategy. Players should verbally communicate their decisions to the appropriate individuals. Players should decide on effective and safe utilization options for their crew. Players should verbally communicate their decisions to the appropriate individuals. Players will gather the most accurate information available to provide a proper size up to dispatch. The player will then develop his/her strategy to initial attack the fire. The player must also manage somewhat uncooperative structure fire resources. 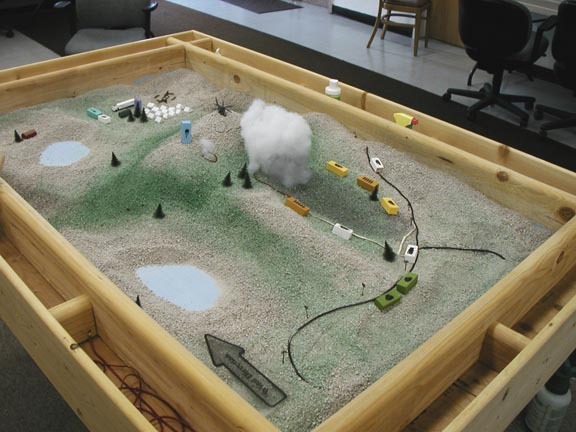 Players should demonstrate the ability to gather the necessary information in the line briefing to formulate a plan of attack for dozer line construction and adjust as needed to mitigate identified hazards. Players will determine if the resources assigned are adequate to complete the mission. Players should verbally communicate their decisions to the appropriate individuals. Players will be tasked with implementing a plan of action and coordinating resources. When on scene, utilize resources in a safe and effective manner. Players should verbally communicate their decisions to the appropriate individuals. Players should establish radio communications with aircraft, describe target descriptions, and give positive or negative feedback to the pilot. Players should reference their IRPG. Players should determine the feasibility of a backfire assignment and develop their subsequent plan of action. Players should verbally communicate their decisions to the appropriate individuals. Players should recognize ineffective operations and react to that situation. Players should verbally communicate their decisions to the appropriate individuals. This can be used as a drill to discuss Standard Firefighting Orders #2 and #3. Players should decide on direct or indirect attack strategy. Players should verbally communicate their decisions to the appropriate individuals. Players should decide how to implement a firing assignment. Players should verbally communicate their decisions to the appropriate individuals. Players will determine how to manage an incident within an incident. Players should verbally communicate their decisions to the appropriate individuals. Players will determine the appropriate level of engagement for the assignment. This can be used as a drill to discuss the IRPG reference “How to Properly Refuse Risk.” Players should verbally communicate their decisions to the appropriate individuals. Players will decide how to apply the Standard Firefighting Orders, deploy resources, and consider other values at risk on a wildland fire use assignment. Players should verbally communicate their decisions to the appropriate individuals. Players will determine how to adequately logistically support a remote fire that has challenging access issues. Emphasis should be placed on logistical planning and ordering of equipment and labor through dispatch that is necessary to fight the fire and support crews for the duration of the incident. Players should decide on how to prioritize ordering and issue of logistics. Players will address and identify all operational needs and concerns for each functional area on an Incident Management Team during the three phases of the operation presented (arrival at incident, mid-operation, prior to end of operation). Player should decide on effective and safe utilization of air resources (logistics vs. operations). Players should verbally communicate their decisions to the appropriate individuals. Players will be tasked with implementing a plan of action and coordinating resources. Players will recognize regional differences and deal with unfamiliar fuel types, tactics, and drought indices. Using reference from the Incident Response Pocket Guide, they will collect information needed for a fire size-up and communicate it to dispatch. Also, the players will initiate incident management, implement a plan of action, and direct and coordinate resources. Players will develop, document, and communicate intent, objectives, and plan of action using the situation awareness developed from the sizeup TDG. Players will practice the decision making process by collecting information needed for a fire size-up and communicating it to Dispatch. Players should establish command and control with resources on scene and should verbally communicate their decisions to the appropriate individual/resources. 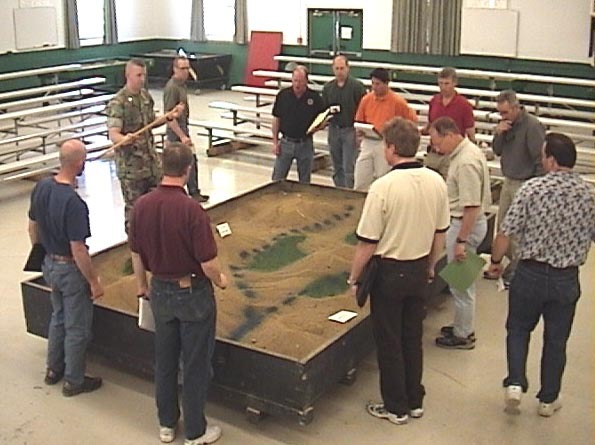 Players to practice the decision making process by recognizing that the complexity of an incident is beyond their abilities and then conduct a briefing with the new commander. Additional objectives for trainees include: develop situational awareness, develop a plan of action, and brief incoming resources. Players will be tasked with assuming command of a Type 3 fire complex, assessing incident priorities, coordinating resources, and ensuring needs are met through ordering resources.